Upgrading the suspension system of a vehicle is often overlooked by driving enthusiasts. A better performing suspension system can greatly improve your driving experience both on the street and the track. A well tuned suspension gives you better handling, even tire wear, longer tread life, and a comfortable ride. It also makes your car more fun to drive by increasing your vehicles responsiveness. The sway bar connects the left and right suspension together to maintain tire contact and traction while turning. Factory sway bars are not designed to optimize handling, they allow a considerable amount of body roll from side to side. Thicker sway bars provide more resistance to a vehicles tendency to lean side to side while making sharp turns. Aftermarket sway bars improve vehicle handling by increasing vehicle stability through turns allowing you to drive faster and push the limits of your car. Cusco?? 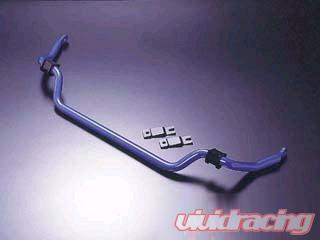 ?_s sway bars give your car a more sports car like feel both on the street and at the track. Cusco swaybars are a great addition to improve the handling characteristics of a near stock street vehicle or they can be used to begin the modifications of an all out track car. Contact Us with any questions..